The iconic rock band have revealed the title and release date of a brand new studio album, unveiled a handful of extra shows on their highly-anticipatedOne Night Stand tour and on top of all that they are excited to announce that they have coaxed Grinspoon out of an indefinite hiatus to be their special guests on 7 shows. 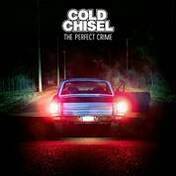 Cold Chisel‘s new album will be called The Perfect Crime and will hit stores on Friday, 2 October coinciding with the first gig on their One Night Standtour at the Deni Ute Muster. Featuring songs drawn from recording sessions across 2014 and 2015, the album will be kick-started by the single Lost, which will be released to radio and TV tomorrow, Friday, 28 August. Pre-orders for the album will also be available at all music retailers from tomorrow morning. The newly announced extra shows on the One Night Stand tour will happen in Geraldton (WA), Adelaide, Melbourne and Sydney. The show at Adelaide’s Entertainment Centre on Tuesday, 17 November is in direct reaction to the huge outcry from their hometown fans demanding a show on the national tour. Cold Chisel played a one-off show at the Clipsal 500 in March to over 35,000 people and thought that they had exhausted demand. But their fans let them know, in no uncertain terms, that this wasn’t the case. The show atMelbourne’s Rod Laver Arena on Thursday November 19 comes as Cold Chisel‘s headline show at Hanging Rock, Vic is about to sell out. The band has also announced that on Tuesday, 15 December they will play a third and final show at Sydney’s Qantas Credit Union Arena to mark the closure of this iconic rock & roll venue. This additional Sydney date is very significant forCold Chisel fans – it marks the anniversary of the final show of the band’s famous Last Stand tour, which ended at the Sydney Entertainment Centre on 15 December 1983. Cold Chisel are excited to announce that they have managed to persuade the much-loved Grinspoon out of hiatus to be the band’s special guests on 7 shows. Grinspoon have been added to the already-announced One Night Stand shows at 1300SMILES Stadium in Townsville on Saturday, 7 November and at the Darwin Amphitheatre on Tuesday, 10 November and they will join Cold Chisel in Adelaide, Melbourne and on all 3 shows at theQantas Credit Union Arena in Sydney. This return of Grinspoon will be exclusive to these shows with Cold Chisel. “To say we are excited to be supporting Cold Chisel is an understatement,”says Grinspoon frontman Phil Jamieson. “The show we played on the Light The Nitro tour was one of the most memorable shows I have ever played in my life! Arm in arm, all of us – Pat, Joe, Kris & I. Singing at the top of our lungs to ‘Flame Trees’. Grinspoon have NEVER been arm in arm before. It was a moment. I think I may have even fallen into a bush in my excitement. Members of COLD CHISEL’s mailing list will get exclusive first access to tickets for all of these new shows on the One Night Stand tour. All members will be able to buy a maximum of six (6) tickets from 2.00pm on Tuesday, 1 September until 10.00am, Thursday, 3 September using a special password which will be emailed to them on the evening of Monday, 31 August. Further tickets will be offered to members of the My Ticketek and other affiliated databases from midday on Wednesday, 2 September until 10.00am on Thursday, 3 September before a final allocation of seats is offered to the general public at midday on Thursday, 3 September. All times mentioned are local times. NB: To receive the password for the Cold Chisel Database presale you must be signed up for the Cold Chisel mailing list before 6.00pm on Sunday, 30 August. The password will not be supplied via Facebook or any other Cold Chisel channels. To receive it you must be signed up to the email database. To sign up now and guarantee first access to tickets please click here.